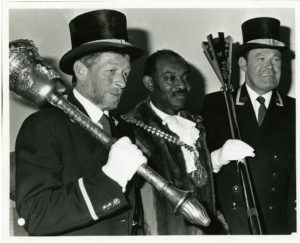 In 1990, Victor Emanuel Hills became the 43rd Mayor of Slough, in England. Previously he had been the first black man to hold the position of Councilor in the borough. Slough was one of the places were Kittitians and Nevisians settled after moving the UK in search of work. Vic Hills was one of them. Hills was born in Newton Ground in 1931 and went to England in 1957 were he found work as an export packer at a pharmaceutical company. In 1966 he began working on the assembly line of the Ford Motor Company and kept that job until he was made redundant in 1985. At Ford he was also shop steward and a member of the Joint Works Committee. In 1972, Hills was elected to represent his branch at the Transport and General Workers Union on the management committee of the British Labour Party and the following year he ran as the Labour candidate of Chalvey Ward and won the seat. He lost the seat in 1976 and regained it in 1984. Hills served on a number of committees including the West Indian People’s Association. Hills visited St. Kitts as mayor in 1991. Hills passed away on the 20th January 2015. The borough that he served remembered him as a dedicated and popular community leader.